Paul specializes in personal injury claims and criminal law. 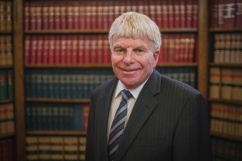 He has extensive trial experience with very successful results in all levels of court, including the Ontario Court of Appeal, the Ontario Court of Justice, and the Ontario Superior Court of Justice. Paul has extensive experience as a personal injury lawyer, including claims for injuries from car accidents, slip and falls, faulty products and wrongful death. Personal injury cases can be complicated and difficult. Paul has extensive experience in these matters and can work with you to achieve a fair resolution to your case. He has represented injured persons in both jury and nonjury cases. As a member of our team of criminal lawyers, he has acted as defence counsel in numerous trials for serious criminal charges such as murder, sexual assault, criminal negligence, domestic assault, impaired driving and arson. Paul grew up in Oshawa. He attended Sunset Public School and O’Neill C.V.I. He returned to Oshawa after attending university to raise his family. Paul became involved with Durham Region sports as a result of his children. He coached soccer in the Oshawa Parks League for a period of 10 years at both the house and rep level. He was also involved as a hockey team manager and trainer for the Little NHL. Paul served as a director of the Criminal Lawyerʼs Association for the period of 10 years. Paul has always enjoyed a variety of activities, especially if it involves his family. He has belonged to Kirby Ski Club and has belonged to the Oshawa Tennis Club for the past eight years. Our skilled legal team are here to help you. Simply fill out our consultation form and one of our team members will connect with you for a free consultation. Sign up to receive our latest news, e-blasts and articles sent straight to your inbox. © Kelly Greenway Bruce. All rights reserved.